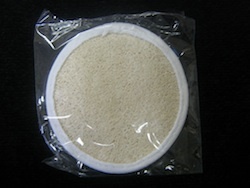 Personal round loofah scrub, finished edges, individually wrapped. Sold in quantities of 10 pieces. Discount on purchase of 5 sets or more.